A few months ago, I bought fresh tuna for the first time. We never really saw it at the grocery store before and when we did, we were intrigued to try it out. Because it was a beautiful piece of fish, I wanted to cook it super simply: crusted in black and white sesame seeds, seared and served over rice with some sesame sauce and vegetables. It was delicious. And, for a meal that feels so special, it was crazy how simple and fast it was to pull together. Everything was ready to go by the time rice was done cooking. A perfect weeknight dinner. 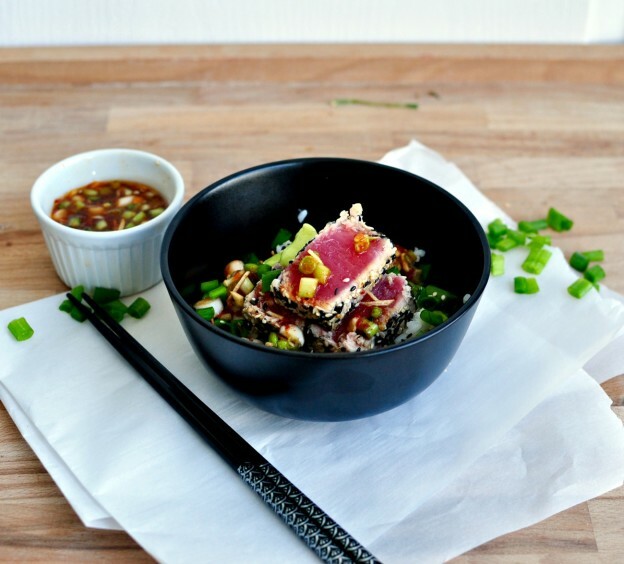 So, last week, when I saw some more good quality tuna at the store I figured it was time to make this sesame seared tuna bowl again. This entry was posted in Asian, Fast Weeknight Dinner, Main, Seafood and tagged easy recipe, easy tuna, easy tuna recipe, fast recipe, fast tuna recipe, food, recipe, Rice, rice bowl, rice recipe, seared tuna, seared tuna bowl, seared tuna bowl recipe, seared tuna recipe, sesame rice recipe, sesame seared tuna, sesame seared tuna recipe, sesame tuna, sesame tuna recipe, tuna recipe on June 17, 2015 by mysecondbreakfast.